Daimler will present its 2008 earnings Feb. 17. Pictured is Daimler's Stuttgart headquarters. Daimler will announce 1.6 billion-euro ($2.1 billion) savings to counter a slump in demand for new cars, the Stuttgarter Zeitung said, without citing sources. The savings will come from accelerating a cost-cutting program for passenger cars, the newspaper said. Daimler will strengthen its "Go for Ten" efficiency program to achieve more savings, according to the report. 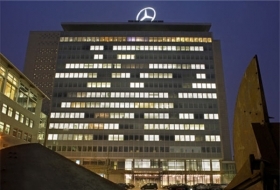 Daimler will present its 2008 financial results Feb. 17. According to Dow Jones Newswires, Daimler is likely to post a loss of 105 million euros on its 2008 earnings before interest and taxes. Excluding special items, Ebit is forecast to be a profit of 249 million euros. Daimler is expected to have swung to a net loss of 82 million euros after a net profit of 1.76 billion euros in the fourth quarter 2007. The automaker issued two profit warnings last year, most recently in October when it warned its forecasts are uncertain due to the turmoil in credit and financial markets. Daimler also plans to extend until the end of the year shorter working hours for employees and may postpone pay raises until December, which were originally planned for May, the Stuttgarter Zeitung said.